In a global first, the country’s largest retail landlord Vicinity will trial a clear glass structure which converts sunlight into electricity, as the shopping centre landlord ramps up its commitment to solar power, reports the AFR. The mall owner has partnered with ClearVue Technologies to replace the glass in its Warwick Grove shopping centre atrium entry with 26 solar cells, generating up to one megawatt-hour of power per year. The new structure that uses the clear, photovoltaic solar glass which collects infra-red light and deflects it to the surface edge where it is then converted into electricity for the mall. ClearVue said this is the first commercial-sized installation of fully transparent solar cell glass in the world. “While other products exist, these are typically optically distorted or coloured, or they are not yet commercially available and are still in the research and pre-commercialisation stages,” a ClearVue spokesman said. Vicinity Centres executive general manager for shopping centre management, Justin Mills, said the new technology could transform the way Vicinity uses glass in its centres. “[It] reinvents the way we harvest renewable energy, reduces our exposure to the volatile energy market and our carbon footprint—a key focus for Vicinity, he said. The technology uses materials sandwiched between two panes of glass that prevent heat and invisible ultraviolet and infrared light waves from passing through the glass. These invisible light waves are deflected to small photovoltaic cells at the edge of the screen that generate electrical power. Meanwhile visible light passes directly through the glass, says The Sydney Morning Herald. See-through solar cells were first developed in 2015, but they have previously not been used at this scale. The transparent solar panels will be used to power lighting in the atrium, outside signage, a digital display screen within the centre, and send any excess energy to battery storage for use at night. This is the latest solar investment for Vicinity, which has committed $73 million to develop solar power systems across 22 of its centres capable of generating around 31 megawatts by the end of the year. “The Warwick Grove Centre project represents a major milestone for the company and is our first real site where people are able to see the ClearVue photovoltaic glass being used and performing in a commercial setting,” said Victor Rosenberg, executive chairman of ClearVue. 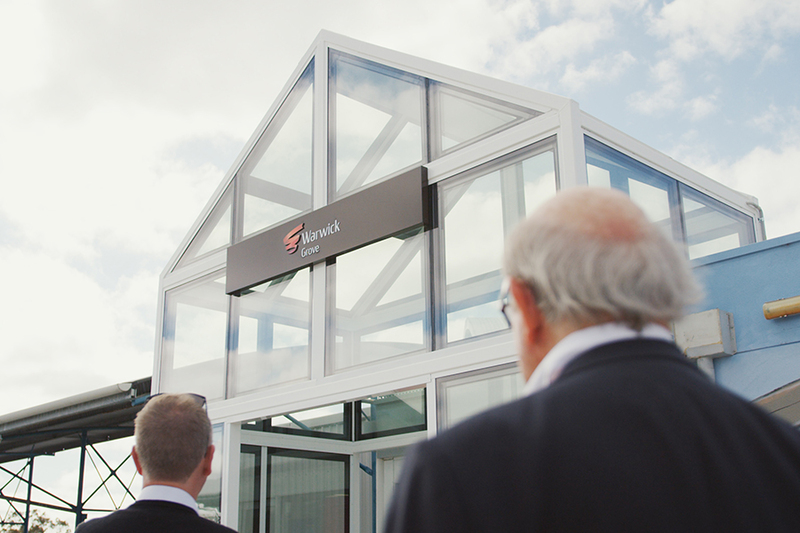 “By integrating our solar glass into the atrium entrance at this centre, we are now able to demonstrate how ClearVue’s technologies can be deployed as skylights and building facades in commercial and retail applications,” said Mr Rosenberg. Other retailers are also joining the push to reduce power costs by installing solar power. Aldi is currently rolling out solar installations across 30 of its stores and a distribution centre South Wales and Queensland, says the AFR. Combined, the 31 installations are designed to generate more than 6.3 GWh of clean energy every year. Aldi’s solar roll-out comes as other major landlords incorporate such installations to defray rising power costs. Stockland, a diversified property trust, is also covering the rooftops of 10 of its shopping centres with 6.4 hectares of solar panels. In addition, Brisbane Airport is setting up a six-megawatt system across six buildings, while Brisbane Market is expanding its current solar program to more than 5 MW across 23 buildings. The AFR also reports that Sydney craft beer brewery 4 Pines raised $100,000 in 17 minutes via crowdfunding from retail investors to build a 100kW solar power installation at its Brookvale craft brewery on Sydney’s north shore.